The glenohumeral joint, commonly known as the shoulder joint, is a synovial ball and socket joint and involves articulation between the glenoid fossa of the scapula (shoulder blade) and the head of the humerus (upper arm bone). The glenoid fossa is shallow and contains the glenoid labrum which deepens it and aids in stability. With 120 degrees of unassisted flexion, the glenohumeral joint is the most mobile joint in the body. Scapulohumeral rhythm helps to achieve further range of movement. The rotator cuff muscles of the shoulder produce a high tensile force, and help to pull the head of the humerus into the glenoid fossa. The glenohumeral joint has a loose capsule that is lax inferiorly and therefore is at risk of dislocation inferiorly. The long head of the biceps brachii muscle travels inside the capsule to attach to the supraglenoid tubercle of the scapula. Because the tendon is inside the capsule, it requires a synovial tendon sheath to minimize friction. A number of bursae in the capsule aid mobility. Namely, they are the subdeltoid bursa (between the joint capsule and deltoid muscle), subcoracoid bursa (between joint capsule and coracoid process of scapula), coracobrachial bursa (between subscapularis muscle and tendon of coracobrachialis muscle), subacromial bursa (between joint capsule and acromion of scapula) and the subscapular bursa (between joint capsule and tendon of subscapularis muscle, also known as subtendinous bursa of subscapularis muscle). 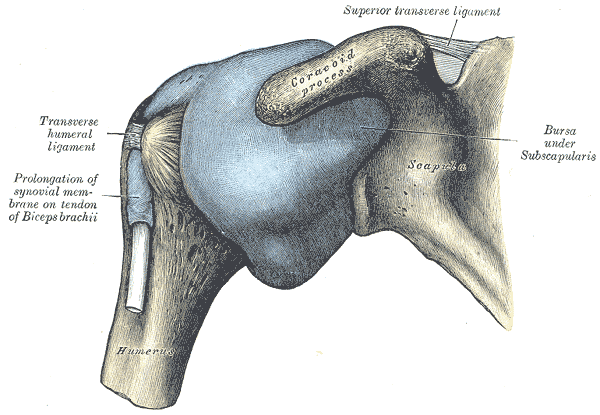 The bursa are formed by the synovial membrane of the joint capsule. An inferior pouching of the joint capsule between teres minor and subscapularis is known as the axillary recess. 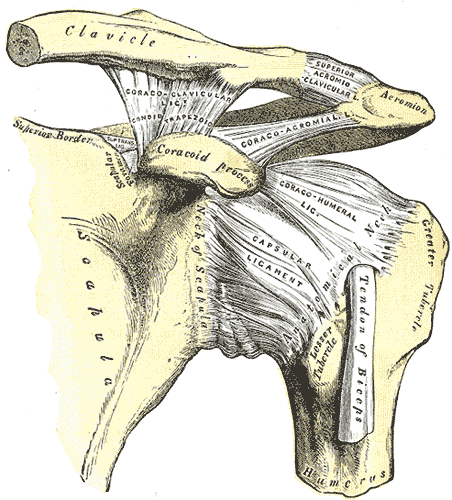 It is important to note that the shoulder joint is a muscle dependent joint as it lacks strong ligaments. This page was last edited 15:33, 9 August 2012 by wikidoc user WikiBot. Based on work by Cafer Zorkun, charlesmichaelgibson@gmail.com and Alexandra Almonacid and wikidoc anonymous user 86.135.86.88.